Shaun the Sheep is baAAAAAaaa-ck with more great episodes. Shaun and the rest of the barnyard sheep keep our family in giggles. The new Shaun the Sheep: A Whooly Good Time, just came out on February 16th, 2010 from Lionsgate and HIT Entertainment. Our family was really excited to see what Shaun and the rest of the barnyard sheep would be up to this time! The kids and the adults in our house laughed when "The Farmer's Niece" came for a visit in the. She looks just like the Farmer, and she is a little trouble maker. She gets her way, or she will holler. Shaun finally gets an idea that will make the little girl happy which turns out to be a hilarious disaster. Shaun and the Sheep sure have a blast with the Farmer's clothes line and his laundry in the "Wash Day" episode. After making a mess of the clothes, the sheep decide to "clean" the clothes. Sheep+wash machine+ bottle of detergent = trouble! Poor Bitzer, the farmer's dog, is left feeling miserable in "Tooth Fairy" and he will do just about anything to get relief. Shaun and a few other sheep try to help him out with several funny and wacky attempts, only to take a trip to the vet for removal. We totally love Shaun the Sheep DVD's and highly recommend them to you and your family! A little pinch of zaniness and a big dash of fun is the perfect recipe for laughter as Shaun the Sheep and his barnyard buddies Bitzer, Shirley, Timmy and friends get into more wacky shenanigans in Shaun the Sheep: A Woolly Good Time. The laughs keep rising as the creators of the Academy Award- winning Wallace & Gromit are on a roll, dough-ling out more sheep herding mayhem by the baker’s dozen. “Washday” – When the Farmer leaves, the sheep have loads of fun playing with his newly washed clothes hung out to dry. Quick! How to clean up the dirty garments before he returns? “Tooth Fairy” – Bitzer gets a terrible toothache and Shaun takes the job as dentist hoping to help his friend and remove the painful tooth. But after several creative and hilarious attempts at extraction it’s off to the vet for success! But will the Tooth Fairy still visit Bitzer? “The Farmer’s Niece” – The Farmer’s naughty niece comes for a visit and Bitzer and the fearless flock have to put up with her silly antics. “Snore-Worn Shaun” – What can Shaun do to stop Shirley’s snoring? Nothing works so he and the flock decide to get her out of the barn with hilarious results! “Helping Hound” – Farmer and Bitzer are fed up with the naughty sheep and hope a robotic dog will keep them in line. But there’s mayhem in the meadow when he turns out to be stricter than Bitzer! “Big Top Timmy” – The sheep awake to find Timmy gone! The search is on and he’s found at a nearby circus. Can Shaun and the fearless flock rescue him and return to the barn before the Farmer finds out? An international hit, Shaun the Sheep recently won an International Emmy Award for Children & Young People. Five minute shorts of the series also currently air in the U.S. on the Disney Channel. Fans can only find full length episodes on the DVDs. HIT Entertainment and Lionsgate have offered to sponsor a giveaway for my readers! This contest is open to bloggers and non-bloggers of the United States. Contest is open until March 18, 2010. To enter, leave a comment about Shaun the Sheep. I'm so glad to see that another Shaun the Sheep DVD is out! My daughter loves him. The claymation (?) is fabulous! Thanks for the fun giveaway. We haven't had the pleasure to see Shaun the Sheep, but I know my daughter would love it. I haven't had the chance to see this one yet, but my family are big fans of Shaun & all of that animation. We first saw Shaun on Wallace & Grommit & have been hooked with all the characters ever since. My favorite family friendly DVD from HIT Entertainment is Thomas & Friends Hero of the Rails. We love Shaun the Sheep! My husband got the Halloween one for his birthday last fall. We've never seen Shaun the Sheep before, but I'd love to and I'm sure the kids would too! He's so cute! My son is a Shaun the sheep fan. Thansk for the chance. BARNEY: BEST MANNERS. My 2 year old loves it! The HiT Favorites - DVD - Here Comes Spring looks really good! My daughter also likes all of the Thomas DVDs put out by HIT Entertainment! She'd like to have Thomas & the Runaway Kite. Thanks! The Shaun of the Sheep remind me of the matress sheep. I love sheep, they are just so cute with their big eyes and their fluffy wool. I haven't seen this one in a long time, but I think it would be fun: Fraggle Rock - DVD - The Complete Animated Series. I would highly recommend Kipper - Water Play from HIT Entertainment. The characters are adorable! I would love to see Elmo's rainbow from HIT Entertainment. We would really enjoy Wallace and Gromit - DVD - The Complete Collection! Shaun is so cute, I am sure it will be a good movie. we are huge fans of shaun. I would love to introduce my kids to Shaun the Sheep. I am a huge Wallace and Grommit fan. HIT Entertainment has a new Barney dvd movie out. It is called "We Love Our Family". I would love to add it to our Barney dvd collection. My son loves Shaun the Sheep. He would love to have this DVD. I also like Liongates' DVD COLORS ARE FUN! A rec from my son: Thomas & the Runaway kite. He could watch it all day long. Barney - DVD - Egg-cellent Adventures would be great for Easter! The animation used in Shaun The Sheep is what appeals to Tristan most. I would also recommend the ANGELINA BALLERINA: FOLLOWS HER DREAMS from Lionsgate. This looks like a fun and entertaining DVD-I can't wait to watch it with my daughter! My kids LOVE Shaun the Sheep! Another dvd I would love to own from Lionsgate is LEAPFROG: MATH ADVENTURE TO THE MOON. Hubby and kids all love Shaun the Sheep! Daily Message - My kids also love Bob the Builder. I also like the Angelina Ballerina - DVD - Angelina In The Wings by Hit Entertainment. Thanks! I could see the kids loving Bob the Builder - DVD - Bob's White Christmas this next Christmas! My kiddos both enjoy Pingu and we are currently enjoying Pingu's South Pole Adventures from HIT Entertainment. My son loves HIT Entertainment's Thomas. My daughter would love the ANGELINA BALLERINA: FOLLOWS HER DREAMS dvd. Daily Message - My boys also love Thomas the Train. The WALLACE & GROMIT: COMPLETE COLLECTION - FS DVD from Loinsgate would be fun to have! Thanks! My daughter would love this!! Thanks for the chance. I've never seen shaun the sheep. It looks like a good show. I also recommend the ANGELINA BALLERINA: IN THE WINGS. We are going through an Angelina Ballerina phase. I have not yet seen Shaun the Sheep, but Wallace and Gromit is one of my favorites, so I know I will enjoy it. Thank you for the chance to win. Oh my gravy, did you know Lionsgate has an animated dvd of Alf? You all certianly remember Alf, the fuzzy brown alien? So cool. My kids love Shaun the Sheep. I am fascinated by the claymation that they use to produce these movies. It reminds me of gumby which I loved as a kid. I love the Wallace and Grommit guys, I haven't seen this one though, my son would love it too. Thanks! We haven't seen this one, but I'm sure my kids would love it. He's funny and my little guy likes to watch. Great show, my daughter loves him, thanks! I've seen Wallace and Gromit but never had the pleasure of seeing a Shaun the Sheep dvd. The whole family loves Shaun the sheep, we would love to have it. I like the alliteration in the title! My daughter just started watching this and loves the 'baa's. LOL, I love the Art Yard competition they have on their site, some great drawings there! I would love to see Lionsgate Barney's Egg-cellent adventure. We haven't seen a Shaun the Sheep DVD yet, but we love Wallace & Grommit! I know my kids would love this . My son and I watch Shaun the Sheep everymorning! We love it so so cute! my son loves it why,who knows but he stops everything to watch! My daughter loves Shaun the Sheep because he is cuddly. I love Shaun The Sheep, the animation is great and so is the humor :D Would love to win this and share it with my son! 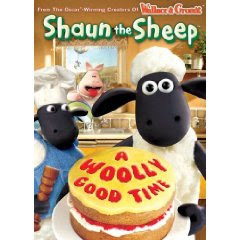 My grandsons are Shaun the Sheep fans and would enjoy this DVD! I joined Sassyfrazz on fb ... which is the same a becoming a fan, right? My kids love Fireman Sam. This look so cute and fun! Lionsgate has the Fraggle Rock collection on DVD. It looks like a cute video. I'm sure my little granddaughter would love watching it. Thanks for having the giveaway! I've only heard of this and would love to get it for my kids. I love Shaun the Sheep and other cartoons from Aardman Studios!